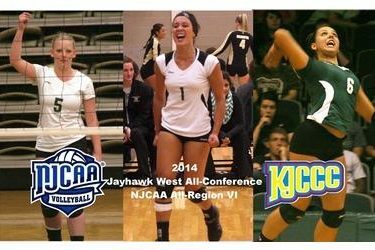 Following a 23-19 campaign and a 3rd place finish in the Jayhawk West standings, three Seward County Lady Saints have been honored by the KJCCC and the NJCAA as Carolina Gasparini, Thayna Silva, and Kari Anderson have all been named All-Jayhawk West and All-Region VI. Carolina Gasparini was a 1st Team All-Jayhawk West and All-Region VI performer for the Lady Saints, repeating the honor for the second straight season. Gasparini finished the year ranked 4th in the Jayhawk West with 2.81 kills per set and ranked 10th in the league, and led all hitters with 3.65 digs per set on the year. She was one of only two players in the league, along with Silva, who ranked in the top 5 in kills and top 10 in digs on the year. Gasparini becomes the first Seward player since Sheina Fernandes in 2009-2010 to earn 1st Team All-League accolades in back to back seasons. Thayna Silva earned 2nd Team All-Jayhawk West and All-Region VI honors for her sophomore campaign. Silva had nearly identical numbers to Gasparini, averaging 2.80 kills and 3.65 digs per set on the season which ranked 5th and 11th respectively in the Jayhawk West. Silva remained one of the top offensive weapons in the league and finished ranked in the top 5 in the league in kills per set on the season despite the fact that she played sparingly in the front row in Seward’s final three matches of the year. Silva now leaves Seward County with All-Conference and All-Region honors in both her freshman and sophomore seasons. Kari Anderson was one of four players named to the All-Jayhawk West and All-Region VI Honorable Mention squads. Anderson led all Jayhawk West players with 781 total digs and 5.39 digs per set on the season, also breaking an all-time Seward County record with those 781 digs in a year. She had double digit digs in Seward’s final 31 matches of the year and eclipsed the 35 digs mark in three different matches. Expectedly, Hutchinson swept the top conference honors as Nicole Kinser was named the Most Valuable Player, Petra Silic was named the Freshman of the Year and Patrick Hall once again collected Coach of the Year honors. The Dragons, who went undefeated in Jayhawk West and Region VI play led all teams with three 1st Team All-Jayhawk West performers and five overall selections while Colby and Seward were both second with three each.